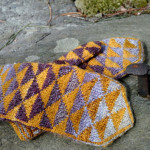 The fall issue of PLY Magazine has been released and I have a new handspun mitten pattern in it. Triangles, zigzags, chevrons, BIG triangles, triangular stripes, triangles for your head!, and generally pointy designs. They’re everywhere! I want them all. I want them to be mittens. I want them to be handspun. So, when Jacey asked me to write a pattern around the use of color, triangles happened. 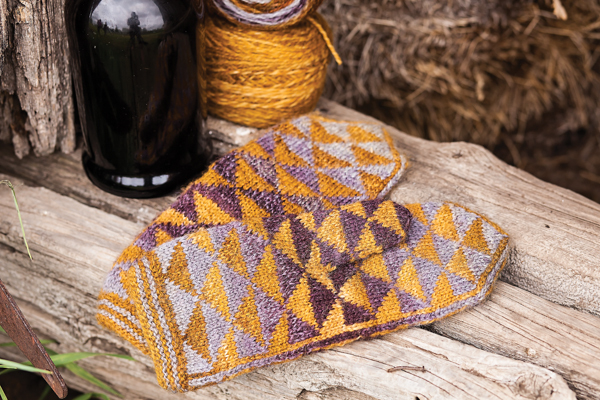 The mittens shown above are knit from handspun semi-solid Spunky Eclectic “Dijon” on Shetland and Hello Yarn “Gobbler” on Cheviot, but the world is your oyster as far as choosing colorways for these. The simple patterning will look great in subtle colors as well as super brights. I have been loving spinning 2 ply striping yarns lately and the pattern covers how I split and spin fiber for 2 matching striping yarns (1 for each mitten) from one 4 oz. bag of fiber. I chose these particular fibers because I wanted a springy, squishy yarn. 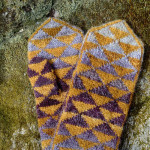 Shetland and Cheviot are crimpy and puffy yet strong- perfect for these mittens where I wanted the graphic patterning to be softened somewhat by both the color and the slight fuzziness of the fiber. To Fit: Choose a size that’s about an inch larger than your hand, measured around the widest part, not including the thumb. When in doubt, go larger. My 7.5” hand is equally at home in 8.5” and 9” mittens. Gauge: 6.5 (6.25, 6, 5.75) stitches and 8 (7.75, 7.5, 7.25) rows per inch. Stitch gauge is more important than row. No one wants a tight mitten! 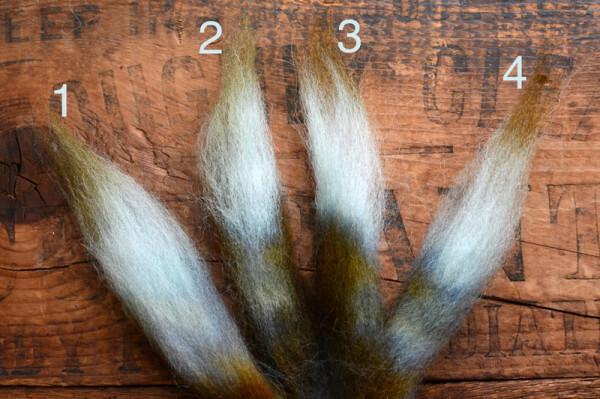 Needles: size 2 (3, 4, 5) US for mitten body, size 3 (4, 5, 6) US for thumb, if desired. Finished mitten size is determined by gauge/needle. I find that my knitting is tighter in very small circumferences, so I use a larger needle for my thumbs. If this is a problem for you, too, going up a needle size helps a lot. Yarn: 120 (130, 140, 150) yards of each of 2 colors. I’d recommend spinning 2 oz./ 174 yards of each in case you need to do any yarn surgery to make the mittens match. For now, the pattern is only available in PLY Magazine, so snap up an issue! It’s a great magazine. I can’t wait to spin for these! so triangley.